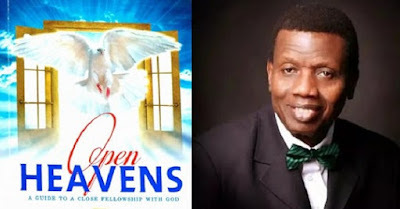 Open Heaven 4 November 2018 Prayer Points on Today – Blessing Associated with banqueting - Open Heavens Daily Devotional Messages, By Pastor E.A Adeboye. 1. I worship You Father, because You are awesome and with you all things are possible. 2. I adore You My Father, because you are The God of Wonders, Who changes times and seasons; who removes and sets up kings. 3. Father please give me a reason to host a celebration this season in Jesus name. 4. Father, in anyway, l have fallen short of Your Glory and Expectations, Please, have mercy and forgive me. 5., there is nothing that is too difficult for You to do, please, turn all my seemingly hopeless situations around, in Jesus’ Name. Amen! 7. Father, let everything that causes shame and reproach in my life, be brought to an end, today, in Jesus’ Name. Amen! 8. Father, let Your Own Report, override every negative report of medical experts, in my life, in Jesus’ Name. Amen! 9. Father, bless me with unimaginable testimonies of victories over those who don’t want me to celebrate in Jesus’ name. 10. Father, let all traces of poverty, sickness, failure, and lack, in my life be terminated, by your redemptive powers, in Jesus’ Name. Amen! 11. Father, let every power saying, no, to my promotion be removed, unceremoniously from office, except he/she repents, in Jesus’ Name. Amen! 12. With Gratitude Praise And Worship Add Your Personal Prayer Request And Please Pray For RCCG, Daddy, Mummy and believers all over the world. We Shall Testify In The Name of Jesus. Amen! Happy First Sunday of November 2018!